Are you a "Scooby Doo" fan, or is it "Pok魯n," "Rugrats," or "Batman Beyond" that keeps your eyes glued to the tube? 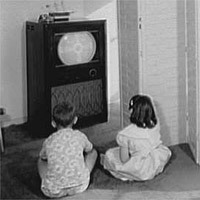 When television shows for children first aired, young viewers had only a few programs from which to choose. ABC (American Broadcasting Company) began broadcasting Saturday morning television shows for children on August 19, 1950, with two programs. Of course, not many people owned a television in the 1950s. What did those lucky children who had a TV watch?